UCF was so, so close to upsetting Duke in Sunday’s second-round game, but the Knights fell, 77-76, and were instantly, visibly crushed by how they lost. (As Aubrey Dawkins’s putback attempt rimmed out and time expired, you can see Terrell Allen, No. 2, put his hands on his head as he falls to the floor in shock.) 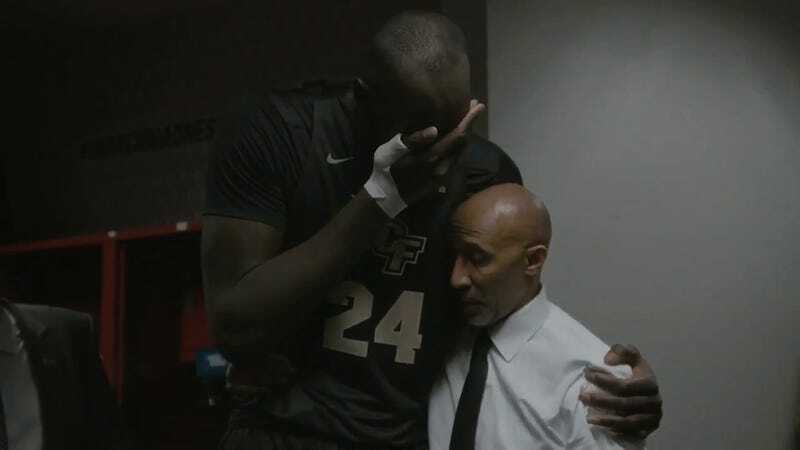 The postgame locker room video is just as rough: UCF head coach Johnny Dawkins tells his team how proud he is as players sniffle and sob. The coach hugs his son Aubrey, a redshirt senior, and consoles 7-foot-6 center Tacko Fall, who covers his face. Aw, man. Why couldn’t it have been the other group of unpaid college athletes crying instead?